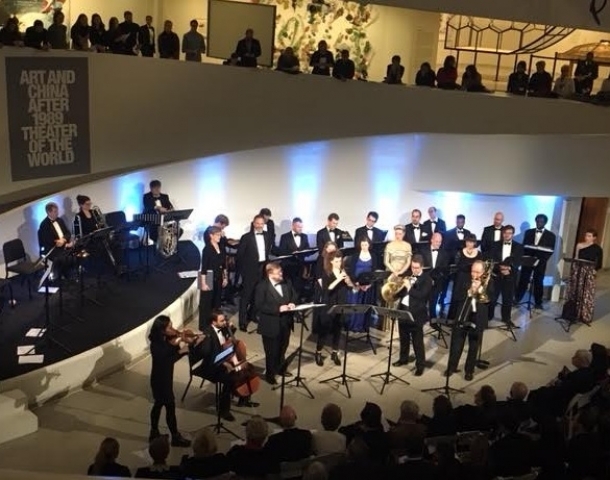 A new star for Christmas at the Guggenheim. Chen Zhen’s Precipitous Parturition. 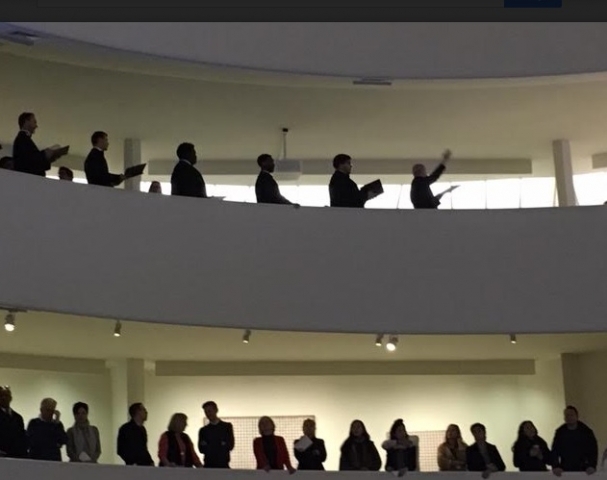 The Vox Vocal Ensemble is perched at the top of the spirals that form the main exhibit area of the Guggenheim Museum. Works & Process is presenting their Holiday Concert. 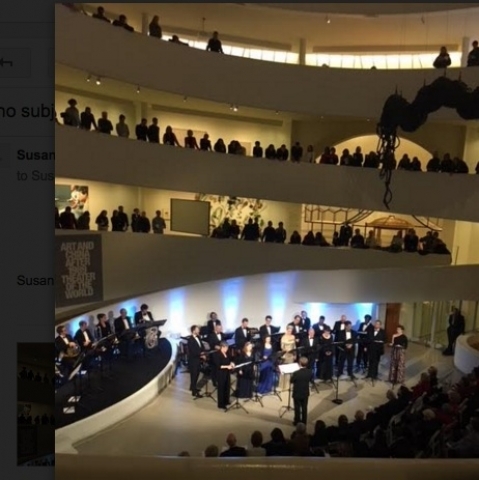 As the audience comes into the rotunda, now filled with chairs, the overflow extends upwards around the spiral, leaning out and up to see the singers. We are confronted immediately by the tops of this particular Christmas tree formation, as a new kind of star is the central piece of the Art in China After 1989 exhibit. 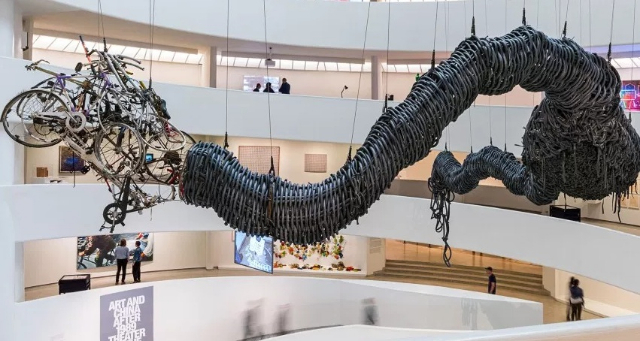 A dragon’s tail topped by a bicycle is Chen Zhen’s Precipitous Parturition. We are in a new global world, yet anchored in traditions of Christmas music. The Christmas program reflects diversity through time. Most visitors to the Guggenheim descend or ascend the spiral, turning toward the wall to look at the featured art of Mark Rothko or Zaha Hadid. Now we are the ornaments decorating the rim of the descending spiral. 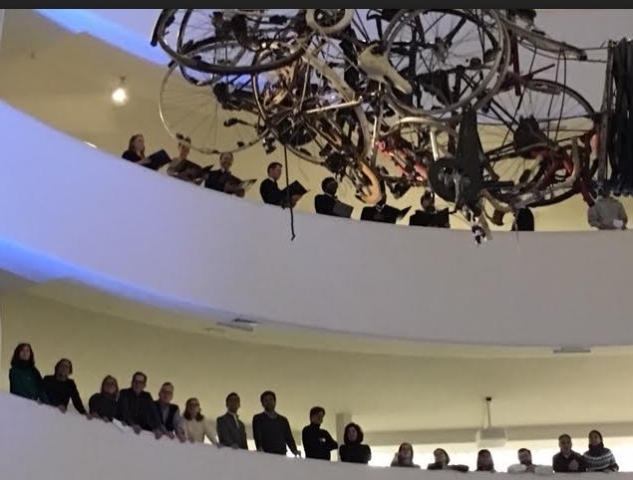 We are lined up like baubles on a tree at the spiral's walls, looking at first up at the Vox Vocal Ensemble, which started singing under the museum's rafters and wound its way, singing, down the spiral to their position tucked under the last curve on the level of the seated audience. If Frank Lloyd Wright, the architect of the building, did not intend to have people lining his beautifully articulate spiral, he would have loved this effect. He would have appreciated the 2017 star, a long dragon’s tail and bike which stretches high above the rotunda. As participants in the program, we listen perhaps more carefully to the marvelous music coming forth from the baton of George Steel, who also wrote the joyful Rotunda Fanfare that heralded the celebration. Featured in the program is the world premier of a new work by Nico Muhly. 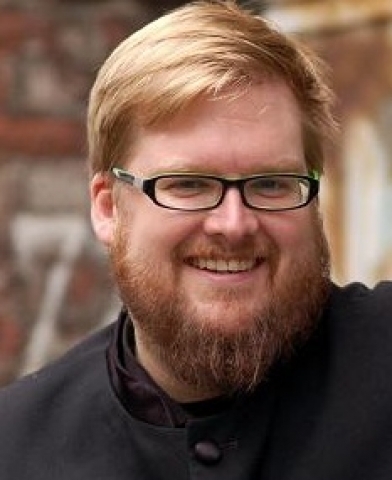 He has moved far from the insertion of “Onward Christian Soldiers” in his opera, Dark Sisters. And yet the repetition which in part characterizes his work has a processional and celebratory feel. Geoffrey Williams was featured singer in the Hurrian Hymn. Muhly is particularly fond of the countertenor voice and Williams sings with a pure, clarion tone. Muhly had been commissioned to write Senex Puerum Portabat for this annual event in 2008. Voices were able to override the tuba and other brass contributors stayed under the voices to create an unusual yet traditional texture. His mentor, Philip Glass, provided North Star, a glistening work which gave its centered direction to singers and audience alike. A spiritual, Go Tell it On the Mountain, had a jazzy arrangement, and syncopation was often heard as the Vox Ensemble sang. Needless to say having heard the glorious voices of the Ensemble, audience members were both inspired and chastened as they sang Felix Mendelssohn’s Hark the Herald Angels, and Joy to the World, which may have been originally lifted from Handel’s Messiah and was arranged by George Steel. Mixing music of the centuries removed us from time to the universal sense that we are all in this together, a spirit that has been sorely lacking in America and may be on its way to revival. A Christmas event like this one paves the way.